A few weeks ago on a trip to Maine we went back to the college town of Brunswick, where one of our sons spent his undergraduate years. It’s one of those small, idyllic northern New England cities with a large village green, tree-lined streets, and ties to American history and literature. Brunswick is also home to several good restaurants and, it being Mother’s Day, we decided to try to find one. We had been to quite a number of the town’s eating places in the past. Our first choice was Henry and Marty on Maine Street, but with the holiday they were booked until 8:30 or so. We opted for another place we’d visited before called Back Street Bistro (because of its out-of-the-way location). We were pleasantly surprised at how much it has improved. For one, the owners have brightened the interior with a lighter shade of paint and maybe new lighting fixtures. Both of us remembered the restaurant as very dark from our visit a decade or so earlier. The staff, too, was very friendly and accommodating—like ushering us right in when we arrived a good half-hour before our reservation time and in proposing a Pinot Noir that was more in our price range than the $50 bottle on the wine list. So even before the food arrived, we were enjoying the place very much. Our dinner also proved to be entirely satisfactory. My husband started off with a chèvre salad which was fresh and delightfully dressed with a balsamic vinaigrette. 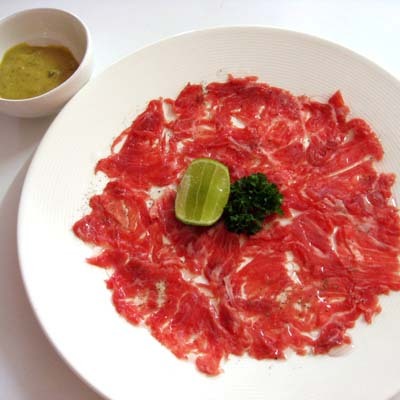 I had the beef carpaccio. The meat itself was fine, if not exceptional like the appetizer served at Joelle’s French Bistro in the Finger Lakes last summer. The outstanding part here was the marinated cubed peppers and lime aïoli served with it. Very nice. Another accommodation made for us at the restaurant was that they allowed us to split the main course. We were not at all disappointed in the evening’s special: a pan-fried duck breast in a tasty sauce on a bed of vegetables. Even the bistro’s dessert menu tempted us. I am always game for crème brûlée and theirs was just right: a hint of vanilla but no other heavily flavored (and just plain wrong!) additions to it. Hubby chose a deliciously creamy chocolate fondant. All in all, it was a wonderful dining experience at not too high a price. We’ll definitely go back! French filmmaking used to be at the top of the form. All one has to do is to think back to great directors of the 1930s like Jean Renoir (Grand Illusion, among others) and the 1960s such as François Truffaut (notably The 400 Blows) to know that this statement is true. In recent years, however, movies from France have tended to be more Hollywood-style, which, in my mind at least, is not a compliment. A few younger directors are beginning to stand out from the rest as inventive in the art film genre. For one, there is François Ozon whose Under the Sand I greatly admired, if not so much others such as 8 Women. This weekend I discovered Xavier Beauvois, who has been creating feature-length films since the early nineties. His 2010 release Des Hommes et des Dieux is really worth seeing. 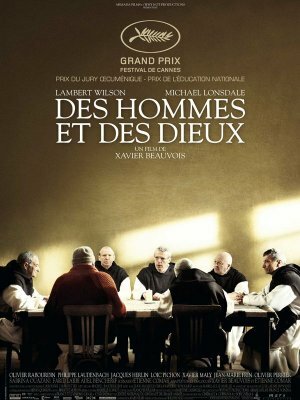 Based on a true story, Of Gods and Men shows the plight of French Cistercian monks living in northern Algeria during the civil war of the 1990s. Whether by providing medical services, helping fill out government forms, or joining in Muslim celebrations, the eight men are devoted to serving the Algerian people. To his credit, though, Beauvois does not portray the men as saints. They are quite human and have the same fears as anyone living as a foreigner in a war-torn country. Some want to leave the monastery for home after a group of Croatians are massacred by terrorists; one monk prays aloud nightly, yet seems to feel abandoned by God; the leader, frère Christian, makes a decision for them all to remain in Algeria without consulting his fellow priests. They ultimately decide to continue their simple, peaceable life praying and farming on their mountain-top retreat, despite being surrounded by two groups who don’t trust them: the Algerian army and Muslim fundamentalists. At one point, brother Luc cites seventeenth century French philosopher Pascal: Men never do evil so completely and cheerfully as when they do it from a religious conviction. 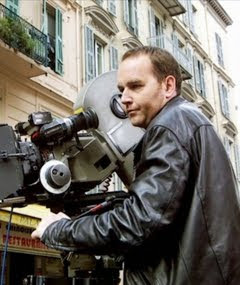 The artistry of the director reflects the film’s themes in many ways. The setting in the Atlas mountains is beautifully peaceful, as are the Gregorian chants sung by the monks. (In fact, I would really love to have this soundtrack.) Several times, Beauvois cleverly cuts from serene moments in the monastery to the brutal, thundering violence elsewhere in the area. The spectator will recall Into Great Silence, the 2005 documentary by Philip Gröning. 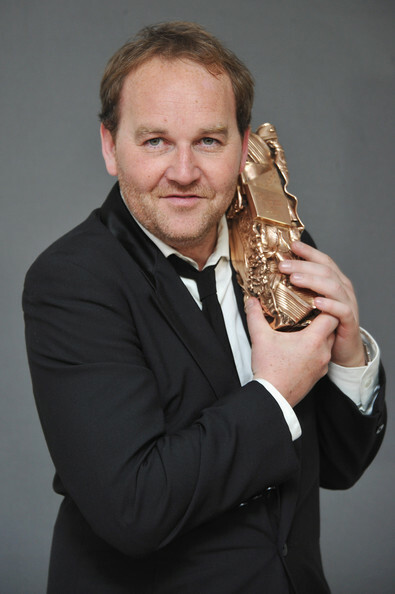 Yet Beauvois’s film, which won le Grand Prix at Cannes in May of 2010, is more deeply moving and haunting. For local friends, it is currently playing at the Spectrum; I thoroughly recommend it.